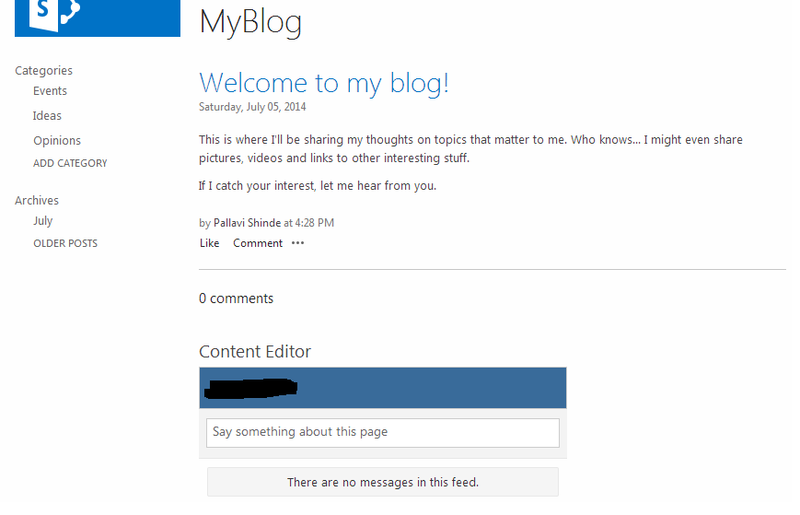 Yammer - SharePoint Embed integration: How to start OG conversations/commenting on Blogs? In last post we saw how we can enable Yammer conversations around documents which is also known as Open Graph (OG) conversations. Now lets see how to implement same here for blogs. SharePoint Blog is one of social feature which is used vastly in intranets. The blog templates comes with default comment section. But if you have Yammer then it is better than default comment section. The benefits of Yammer Comments Embed is that it will reach to maximum number of users quickly and collect replies and thoughts of other people on the blog's content. And this is what the person or dept or organization wants about their blogs. Blogs are nothing but the Voice of person or department or organization, it should reach to maximum people and in quick time. And here the Yammer helps you. Yammer Comments embed helps to allow replies or comments on post, liking post, sharing posts, etc. The best thing this embed gives is the 2 way communication. Both publisher and listeners can take part in conversations or discussion. Another advantage is publisher can get notification quickly on post through Yammer notification. 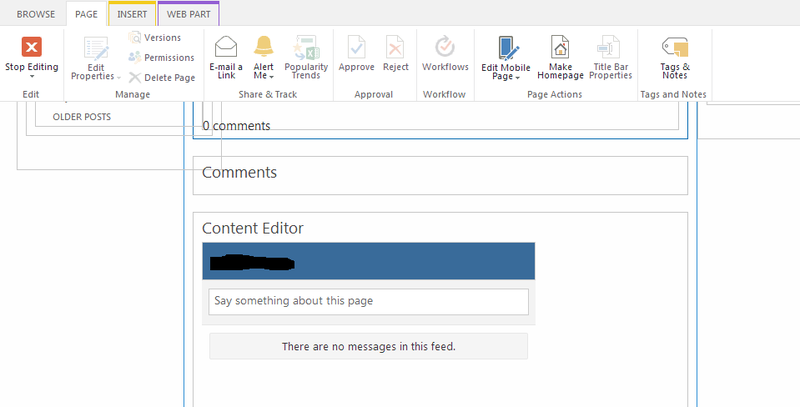 Now lets see how to configure Yammer Comments Embed on Blog page. 1.Create html file and put below code (replace network with your network) in it and save it. 2.Upload the file to the Site Asset library of the SharePoint. 3.Go to the Blog site where you want to implement Comment embed code. 4.Open any blog; all blog gets open in Posts.aspx by default. So we will put our embed code on this page. 5.Open Posts.aspx page in edit mode. 6.Add content editor web part. 7.Give the url of uploaded html file in Content link section of content editor web part(web part properties) . 8.Save the page. You are ready to use comment feed.